I love berries, I have a weakness for strawberries, not necessarily eating them but finding strawberry accessories and toys! I love berry flavored drinks and candy that is super odd tasting some may say! Here is what I am loving right now! I love Metromint water! At first I was skeptical of a berry mint flavor - however it is oddly refreshing. I know it is not for everyone but I love it's oddness. I buy a couple of bottles a week! 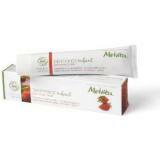 I am currently using Melvita's Strawberry toothpaste. I know it is for kid's but it is tasty, not to foamy and leaves my mouth tasting great! This a cute tutorial on how to make a kawaii strawberry pillow! If you are a candle junkie like me try PurBliss candles! They smell so good! Soy candles if you do not know by now burn longer and are so much better for the environment! I love Lupicia's Strawberry Vanilla tea. I drink it strait up, in my opinion the matcha and strawberry goodness needs no help with soy milk or sweetener! Do you have any favorite berry products right now? Please share! Oooh, the strawberry vanilla teat sounds yummy!